Enos Slaughter was the original "Charlie Hustle" and his non-stop energy and love of the game would later help the St. Louis Cardinals win a World Series title. Sifting through the many options, this top list picks out the highlights amongst the full run of Enos Slaughter cards. 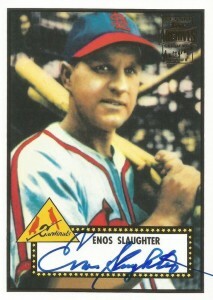 Shop for Enos Slaughter Cards on eBay. 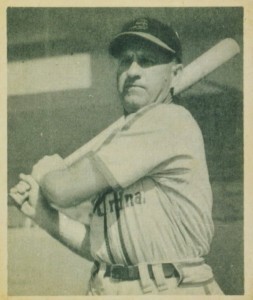 Nicknamed "Country," as he was from rural North Carolina, Slaughter was a mainstay on the Cardinals teams of the late 1930s and 1940s. A 10-time All-Star, he also served as a sergeant in the Air Force for three years during World War II. 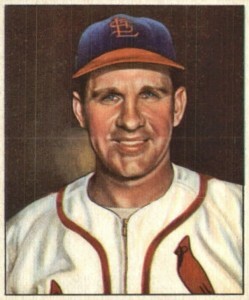 Slaughter played on four World Champions winning teams (two with the St. Louis Cardinals and two with the New York Yankees), but he is probably best remembered for a single play in Game 7 of the 1946 World Series in which he ran through the third-base coach's "stop" sign and scored the winning run for the Cardinals. He had come all the way around from first base on a hit-and-run play and because of the slow throw in from the outfield and no one expecting Slaughter to keep running, he was able to slide and beat the tag. A few modern sets have cards that highlight what became known as the "Mad Dash," including 1994 Upper Deck All-Time Heroes and the 1980 Fleer World Series Team Logo Stickers set. 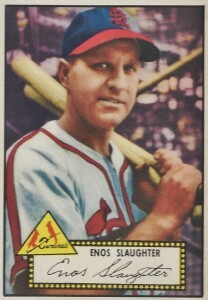 Enos Slaughter is one of the few players that has a baseball card in each of the Bowman sets from 1948 to 1955. Of course, there wasn't enough room on the top list to fit all eight of his Bowman appearances, but they should each be considered must -haves when building a Slaughter collection. Collectors interested in picking up some of his rarer appearances can look at the 1952 Tip Top Bread Label set that were cards packed with, you guessed it, loaves of bread. Another noteworthy option is the 1954 Wilson Franks set which features a beautiful Slaughter card that was packed in with hot dogs. Modern sets of note that have Slaughter cards include 1992 Action Packed All-Star Gallery, which features a slightly raised, three-dimensional picture. 2001 Topps Archives Reserve gives you a beautiful Chrome version of his 1952 Topps card and 2013 Topps Allen and Ginter offers a host of mini parallels. Collectors seeking a jersey or bat relic card can find some interesting combination cards featuring Slaughter with teammates and rivals. In the 2002 Fleer Greats of the Game set, you can find Slaughter relics along with Ted Kluszewski, who played for the rival Cincinnati Reds, on the same card. 2014 Topps Five Star brings together Enos with his legendary teammate Stan Musial for a combination bat relic card that would make any Cardinals fan sit up and take notice. Enos Slaughter's playing career coincided with the baseball card boom of the 1950s and there are many available and important cards to choose from when building a collection. The list of the top Enos Slaughter cards brings together those valuable and yet still accessible options from his Topps and Bowman appearances along with a few rarer cards from lesser-known sets that might get overlooked. Near the end of his career, Slaughter played for several teams in rapid succession. The Cardinals traded him to the New York Yankees in 1954, ending his 13-year run with the team. 1957 Topps was Slaughter's first appearance as a Yankee and his remaining Topps cards were all with the Yankees, even though he also played briefly with the Kansas City Athletics and Milwaukee Braves. 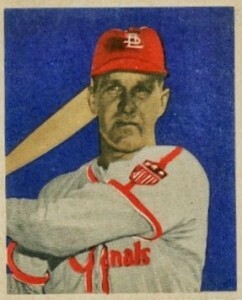 Nearly all of the cards in 1952 Bowman include the player's facsimile autograph horizontally across the bottom of the card. 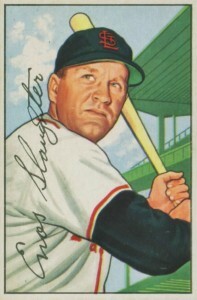 Enos Slaughter's card is one of the exceptions as his large and very legible signature runs up the left side of the card vertically over his right shoulder, nearly grazing his ear. This set could be received from Red Heart Dog Food as a mail-in offer in which you would receive a group of 11 cards featuring either red, blue, or green backgrounds. The full set includes 33 cards. The red background cards are considered slightly more rare than the green or blue set. The card for Slaughter is found within the blue background subset. The Topps Legends autographs series from 2001 Topps Teams offers signed cards from players included in the 1952 Topps set with their real autograph in place of the facsimile used on the original cards. Slaughter's autograph is famous for the enormous "E" leading off his first name. 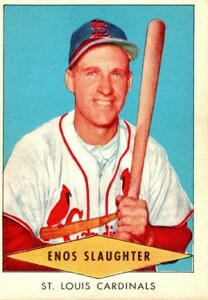 1953 proved to be Enos Slaughter's last All-Star Game appearance as well as his last season with the Cardinals. Outside of the Busch Stadium in St. Louis, Slaughter has been honored with a statue depicting his "Mad Dash" during the 1946 World Series. It is a toss-up as to which is the best-drawn card in Slaughter's cardboard legacy. 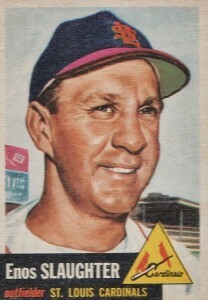 Between 1953 Topps or 1950 Bowman, a slight edge is given to his 1950 Bowman card because of the simple design that features no additional information on the card's front. 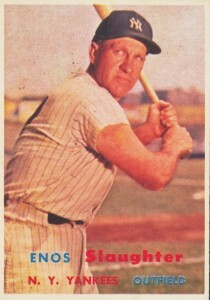 You can find both black and red backs of the 1952 Topps Enos Slaughter card. The stats on the back remind us that he was an oddity of a player who was cross-dominant, meaning that he was right-handed but batted from the left, giving him an advantage against right-handed pitchers throwing breaking-balls. While the card dimensions were nearly the same, just about everything else changed on the front of the 1949 Bowman set compared to 1948 Bowman. Bright, vibrant color was printed over the top of the player's black-and-white photographs, livening them up and creating a sort of middle ground between full-color photography and the older, non-colored sets. Although Enos Slaughter has cards issued several years earlier (see card #1 on the list), collectors often put an added emphasis on a player's first appearance in the Bowman or Topps flagship sets and so his 1948 Bowman card is considered his official rookie by most collectors. The 1948 season saw Slaughter having another great year as he batted .321 with 90 RBIs and he finished seventh in the MVP voting. 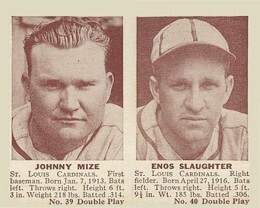 You can't get much better than this Double Play combo card, featuring Cardinals teammates Johnny Mize and Slaughter. They were teammates from 1938 until Mize was traded to the New York Giants following the 1941 season. It is one of the most valuable cards in the set as it features two Hall of Fame members and is one of the earliest Enos Slaughter cards available.